These crocheted necklaces made using Berlini's Tinkerbella yarn are absolutely stunning. 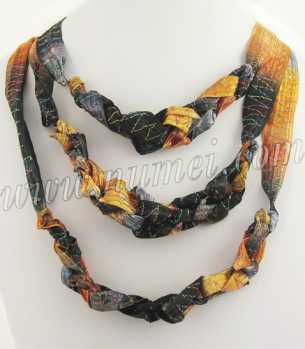 These necklaces will dress up any outfit and also make wonderful gifts. Finished length: Strands measure approx. 18", 21", 24". Length of each strand may be varied according to choice. Strand 1: Measure 6" length from edge of yarn, chain a length of 6", bind off leaving a tail of 6". Cut yarn. Strand 2: Measure 7" length from edge of yarn, chain a length of 7", bind off leaving a tail of 7". Cut yarn. Strand 3: Measure 8" length from edge of yarn, chain a length of 8", bind off leaving a tail of 8". Cut yarn. Align the ends of the 3 strands and attach a ribbon crimp end at each end. Attach a jump ring on one end and a jump ring and clasp on the other end (any clasp would work).